Bartolomeo Manfredi (1582 – 1622) was an Italian painter, a leading member of the Caravaggisti (followers of Michelangelo Merisi da Caravaggio) of the early 16th century. 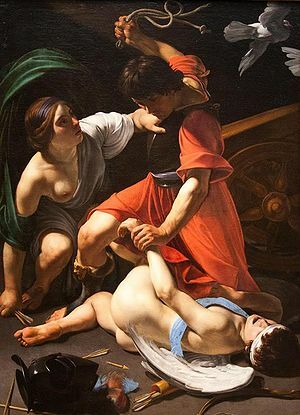 One of his best known paintings is Mars Chastising Cupid (also known as Cupid Chastised), an M/m spanking art scene in which Cupid, naked and blindfolded, is thrown to the floor and whipped by Mars with a length of rope on his bare bottom. A female figure (Venus?) is also present, trying to stop Mars. This work is one of the few examples of spanking in painting. Note that Cupid was often depicted as blindfolded in Renaissance and Mannerist art, due to the contemporary belief that "Love is blind," so to speak. This page uses content from Wikipedia. The original article was at Bartolomeo Manfredi. The list of authors can be seen in the page history. As with Spanking Art, the text of Wikipedia is available under a copyleft license, the Creative Commons Attribution Sharealike license. This page was last edited on 27 May 2012, at 09:49.